ABOARD THE SAFARI ENDEAVOUR — The captain told us last night at dinner that he intended to begin cruising in the wee hours of the morning, looking for the giant fin/blue whales and deep-diving sperm whales that frequent the Sea of Cortez in early November. He also warned us that there was a weather front moving in, so the rocking of the ship might be a bit more extreme. Our cabin’s storage areas are secure and the shelves in the head are designed for much rougher weather than this — so we slept like babies being rocked in a cradle by an over-zealous nanny. 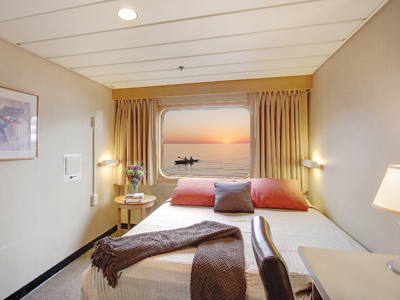 At dawn we set our cabin TV to the feed from the underwater camera on the ship’s bow, hoping to catch a glimpse of any whales — perhaps the pilot whales that call the Sea of Cortez home year-round. We knew we were too early in the season for the gregarious grey whales, which surface for strokes and back scratches from humans in February and March. And we’d miss the humpbacks, which congregate here to give birth and breed from mid-November to late March. But we’d chosen the prime time for seeing whale sharks, the world’s largest fish, in the Sea of Cortez. After scuba diving with these gentle leviathans in the Atlanta Aquarium, I’d chosen the timing of our Un-Cruise Adventure in hopes that we could swim with them in the wild. Bottom line, the Sea of Cortez is a smorgasbord of critter encounters; you just have to choose the schedule that may fulfill your bucket list. Over breakfast we watched waves dashing over the windows of the dining room, which is on the first deck. As the ship rolled, we weaved our way up to the lounge to watch the bow camera and the horizon for critters. The ship attracted a pod of bottlenose dolphins that accompanied us for a while, but unfortunately no whales. We were disappointed, but this is nature, not Disneyland. You can’t cue the whales. The captain set a course for Isla San Jose, where we anchored on the northwest side at Mangle Solo, a quiet harbor with an inviting beach for browsing. 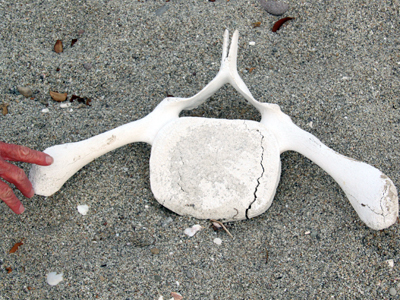 Like the other shorelines we’d visited, the beach was an amalgam of crushed shells and bones of creatures large and small. We discovered some exquisite shells, along with parts of a whale’s backbone and the skeleton of a pufferfish — a sad sight because the big-eyed fish with its stubby fins is one of our favorites. 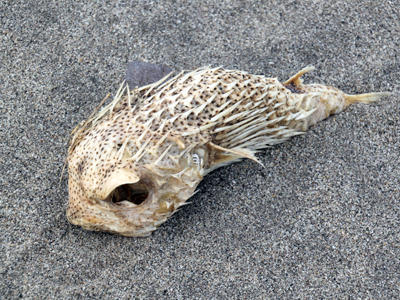 The crew had warned us to wear shoes on the sand because baby puffers quite often wash up on the shore, leaving their tiny spikes embedded in the sand. We also learned to do the “stingray shuffle” entering the water to give small rays a chance to avoid our feet. At dinner chef Mike presented us with main courses of arrachera steak with chimichurri, herb-poached grouper or arepa de huevo (corncakes with eggs fried inside). Afterward in the lounge, it was guide Ellie’s turn to give us a short presentation. Her droll humor (so like Amy Schumer) soon had us in stitches, but we did absorb some of the dramatic history of the area — namely the black pearls. From the 1500s to the 1850s, Spanish conquistadors plundered the oyster beds in the Sea of Cortez to supply the demand among European nobility for black pearls. The gulf was the world’s only known source. In fact, explorer Hernan Cortez, for whom the area is named, is credited with starting the craze. Catherine the Great was an aficionado of the precious gems, as was Marie Antoinette. As a result of overharvesting, the oyster beds were decimated. Today black pearls are back in the Sea of Cortez, but they are cultured and harvested in limited numbers. The weather front is still with us, so the captain warned us that it might be rough sailing when we get underway early tomorrow for Los Islotes, where we hope to swim with young pups in the sea lion colony there.